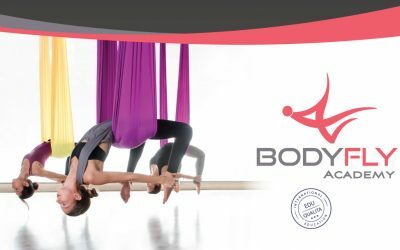 The Body Fly International Academy has a leading role in the education, training and development of aerial Yoga and Fitness with a Dance & Pilates inspired approach. The Academy’s focus is to foster professional development of aerial fitness on the international level. Body Fly is a dance inspired approach to aerial yoga. It combines the bene ts of the world’s nest methods such as traditional Yoga, Pilates, Dance and Aerial Acrobatics. It is a workout that integrates and profoundly mobilizes full body and mind in a holistic way. By practicing Body Fly, you empower yourself to maintain your physical tness while balancing your mind. Through exercising Body Fly, you release tension from your back and decompress your spine in a way that is most bene cial for your health. Besides conditioning your body and building up your core muscles, you may also improve your body awareness, your balance and your posture. 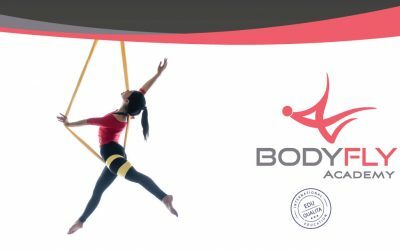 BodyFly was created in 2009 by Patricia Duchaussoy, a professional Dancer and Pilates Master Instructor. The method is organized in a well structured curriculum and is based on physical and biomechanical principles as they are found in Pilates, Dance and Yoga. The structure of the method ensures a safe practice as it allows students to learn gradually, becoming more knowledgeable and stronger at their own pace. During the course of their training, Students learn 5 principles and 10 fundamentals fa- cilitating their practice of aerial movements and ensuring precision and mindfulness of movement which prevents injuries and accidents. The Body Fly method has become an international standard of good practice. The nomenclature of the Body Fly exercises is widely accepted and used by the vast majority of aerial practitioners in Asia and the world. Certification obtained through Body Fly International Academy proves that a students have attended in-class education and practice-teaching for a certain number of hours, as well as passed an internationally standardized examination procedure. Why to join BodyFly ? 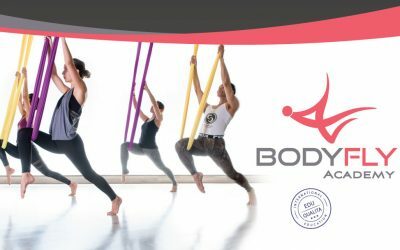 Who can join BodyFly Training ? The Body Fly method is today’s widely used standard of good practice for aerial yoga activities. As a students you will learn all necessary basic knowledge to really teach aerial Body Fly Yoga yourself to your students. There are no hidden fees and no hiding back on techniques or knowledge. Besides all the Exercises, Fundamentals and Principles, you will learn the unique “Body Fly Syllabus” similarly used in Ballet, in order to benefit from a fowing exercise practice and facilitate the interaction between the teacher and students. BodyFly is safe to practice for everybody. The method is taking a special care on the matter of safety and proper movement. However, a minimum of body awareness and flexibility is required to train BodyFly. If you are a Yoga, Dance, Pilates or Fitness Partitioner or you do regular sport, it will surely help you to learn fast and feel comfortable on the hammock quick. You will get a letter of completion after each training course you successfully finish. For each of the training programs you will get an international certificate after successful examination. Any certificate you will obtain from the BodyFly Academy certifies that you went through a professional aerial education program according to international standards.